If you have a foodie on your holiday gift list, The Early Show's resident chef, Bobby Flay, would like to make your life a little easier. He compiled a list of great food-related presents that any gourmand, gourmet and harried home cook would enjoy -- and shared his ideas as part of the show's Holiday Gift Guide. Bobby has a sweet tooth. But he's picky. He won't eat just any old dessert. But he really loves the Ultimate Coconut Cake from the Peninsula Grill in Charleston, S.C. The multi-layered cake, which serves 16, is the creation of the restaurant's executive chef, Robert Carter. But before you log on to the Peninsula site (www.peninsulagrill.com), be warned -- the decadent treat does not come cheap. The cake costs $100 PLUS shipping and handling. And as it is shipped overnight, the cost could almost double (the Web site has more details). Bobby LOVES bacon. And this is a great gift if you have a bacon-lover on your list. Zingerman's, the Ann Arbor, MI delicatessen, has a Bacon of the Month Club. You can purchase a three-month or six-month subscription. This is not the type of bacon you pick up in the supermarket -- these are artisanal, delicious and hard-to-find specimen. The three-month subscription costs $99 and the six-month costs $180. Go to the Zingerman's site (www.zingermans.com) for more details. Are all ice creams alike? Not according to Bobby. He loves his Graeter's Ice Cream (www.graeters.com), out of Ohio. His favorite is black raspberry chip, and he also enjoys seasonal flavors like cinnamon, coconut chip and peppermint. Six pints will set you back $70 (one delivery of six pints to one address) while 12 pints sell for $110. Appliances/tools: If buying food isn't something that you want to do, consider buying a home chef a special tool that can be a wonderful addition to their kitchen. Bobby loves using fresh herbs whenever possible. Do yours always wilt before you can get around to using them? The Herb Saver has been featured everywhere; it triples the life of your fresh herbs. All you need to do is just fill it with water and store it in your fridge. It's available at Sur La Table (www.surlatable.com) for $29.95. To pair with the Herb Saver, consider buying your foodie a mezzaluna -- it's an easy way to cut fresh herbs for cooking. If you want to splurge a little, buy your foodie the Vita-Mix 5200: this is a personal favorite of Bobby's. This is a super blender that blends things very smoothly and quickly. Price: $449.00 (www.vitamix.com). Yes, it's true -- pressure cookers are making a comeback. Bobby swears he can't do an "Iron Chef" competition without his. 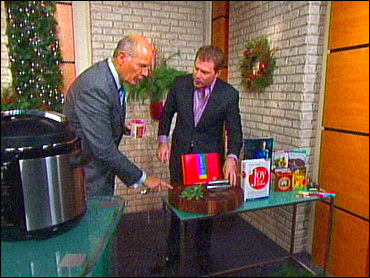 His Cuisinart model is sold at Williams-Sonoma (www.williams-sonoma.com) $149.95. Bobby thinks you should own a plastic cutting board and a wooden cutting board -- one cutting board for fresh produce and bread and a separate one for raw meat, poultry, and seafood. This will prevent bacteria on a cutting board that is used for raw meat, poultry transferring over. Ideally, use plastic for meat and poultry. His suggestions: for wood cutting boards -- nothing beats Boo's Blocks (www.johnboos.com). For plastic cutting boards: there is a new line from "Preserve" -- these are from recycline, one of america's premier brands for design-oriented, environment-friendly products for the home. Prices start at $12.99 (www.recycline.com). Waring Wine Chiller: for the wine enthusiast, the Waring Pro Cordless wine chiller makes it simple to serve wine at just the right temperature. The unit comes with two wine holders to accommodate bottles up to 4" in diameter. $49.95. Cookbooks: There are two cookbooks that Bobby really loves. One is a classic "The Joy of Cooking." This cookbook covers everything from making sauces to baking pies. Bobby believes this is a fantastic reference for all levels of home cooks. The second cookbook is recent: "Jonathan Waxman: A Great American Cook." Bobby credits Waxman for his entry into the food world. He thinks this is a great book, not just for the recipes, but to learn about one of those under-the-radar chefs. Recipe decks: these are perfect for those home cooks who are short on space for storing cookbooks. Each box has a theme, so buy your friend a "deck of recipes" about desserts, pairing wines with cheeses or any number of other topics. Prices start at $14.95. (www.clarksonpotter.com). Gift cards: restaurant gift cards are great when you're not exactly sure what to get your foodie -- and if you get them a gift card to one of their favorite restaurants, they'll really appreciate it!